As its name Dessert Kitchen is a spacey dessert place located at Chinatown that provided variety choice of dessert. The space is more like a restaurant rather than a cafe and they have second floor which suitable for big groups. 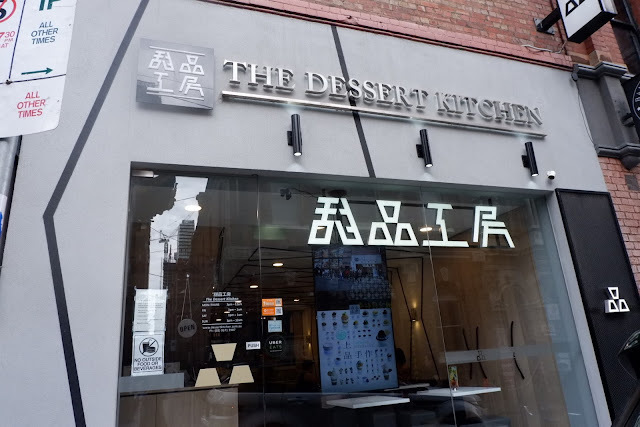 The staffs are friendly; the chef who made my dessert came to my table and explained all the dessert even gave me a recommendation at the beginning. They also had the menu with English and Chinese language. 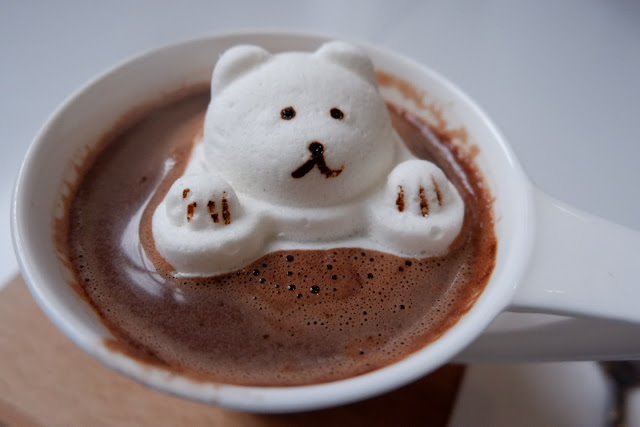 We ordered a marshmallow hot chocolate to start. 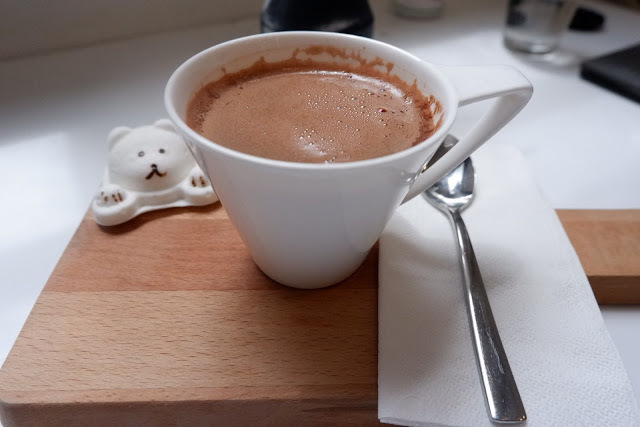 The hot chocolate was yummy but it became too sweet when we put in the marshmallow and we were expecting more creamy from the milk. Coconut Ice. 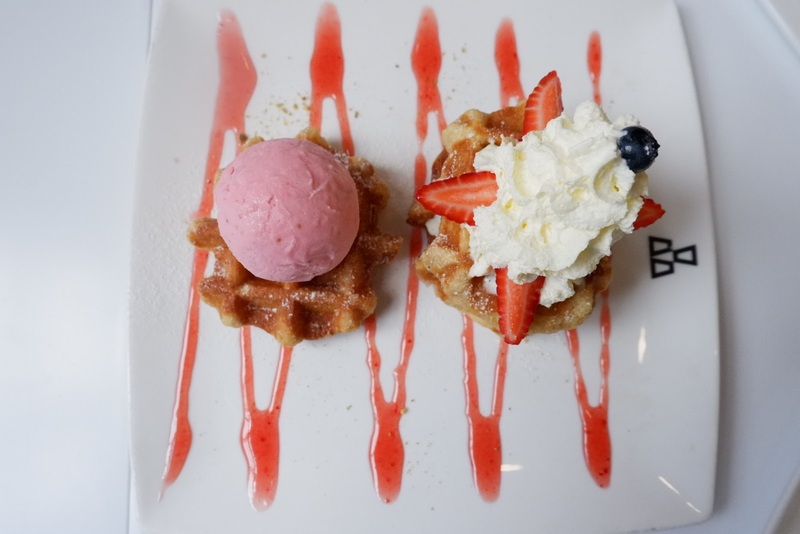 This kind of dessert is perfect for summer. 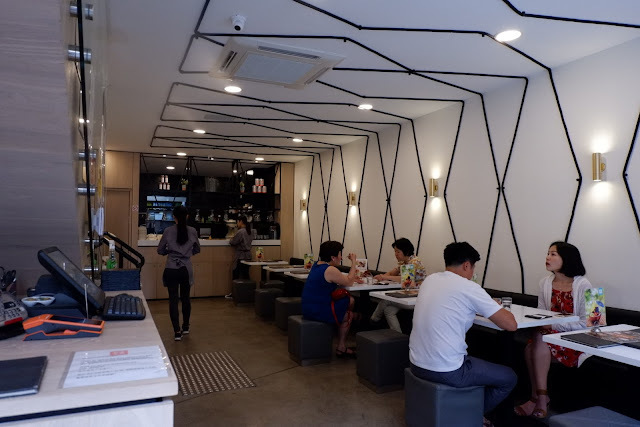 The coconut ice is not too sweet or we could say it is very mild. 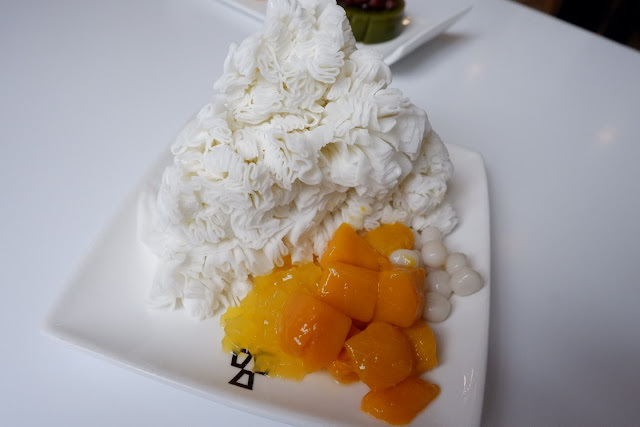 Unfortunately, the mangoes are not really fresh even a little bit off but it was okay to eat, and the rice ball had a good consistency to chew. 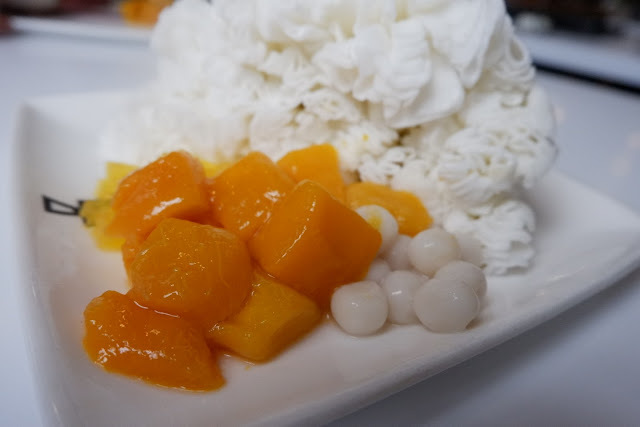 This coconut ice compliments the mangoes and the rice ball successfully make a harmony for the dish, it is considerate as a light to medium dessert when you need something light to share. Japanese Green Tea Soba. It has a nice plating with a long square plate. 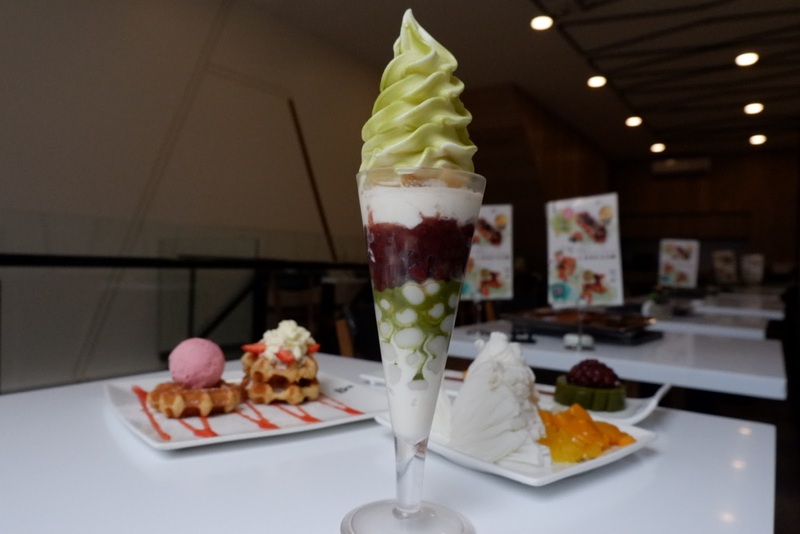 The matcha pudding with the red bean on the top is awesome, we had a strong matcha in flavour yet balanced with the red bean. 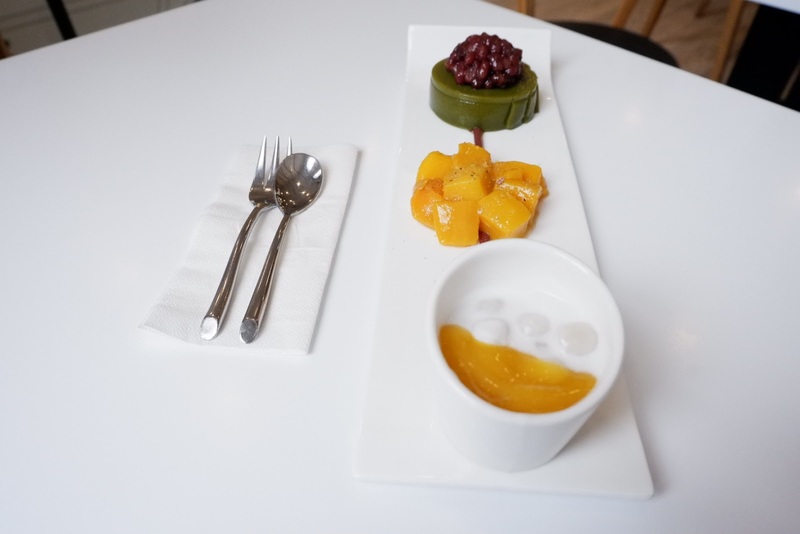 In the middle is just mangoes, the mangoes in this dish were better than the mangoes we had in the coconut ice before, the mangoes made our tongue a bit calm after a strong taste of matcha pudding. 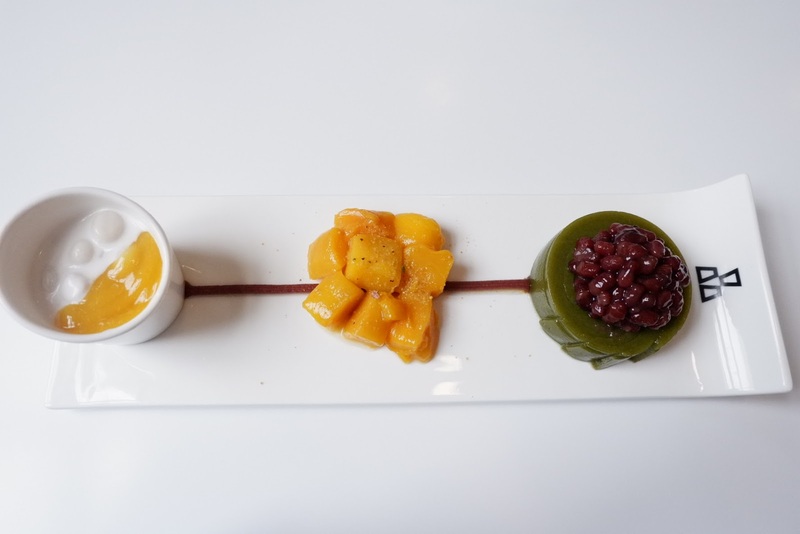 Last component of the dish is rice ball with coconut milk and mango puree, I think it is the lightest out of three. 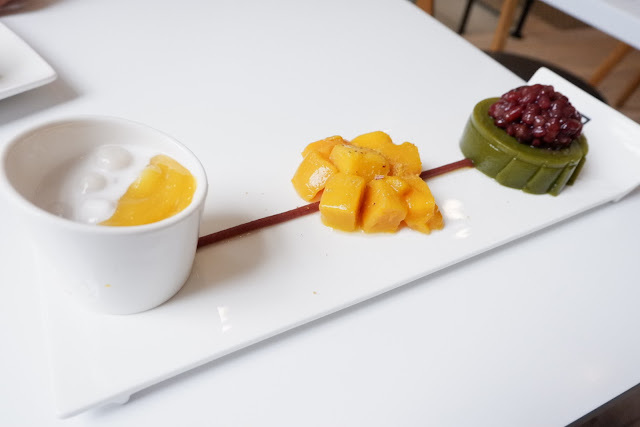 We pretty sure they don’t put much sugars in the coconut milk rice ball and the mango puree because it taste so natural. We believe they put three component in order from the strong to light or on the other way. Waffle - with strawberry ice cream. It is a beautiful, pretty, feminism and elegant dessert that makes people crave while they look at it. 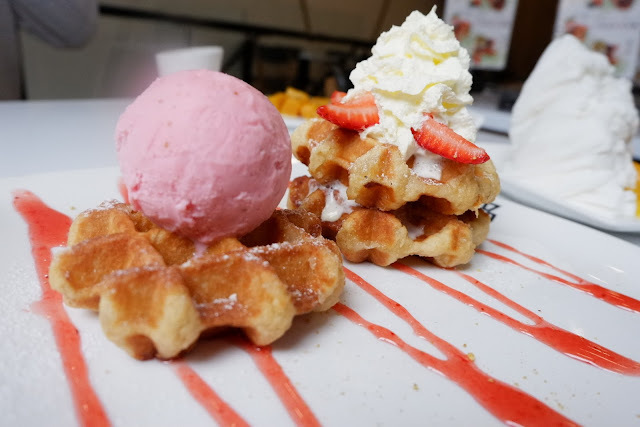 The waffle is soft yet heavy but going really well with the strawberry ice cream (you can choose your favourite ice cream flavour). 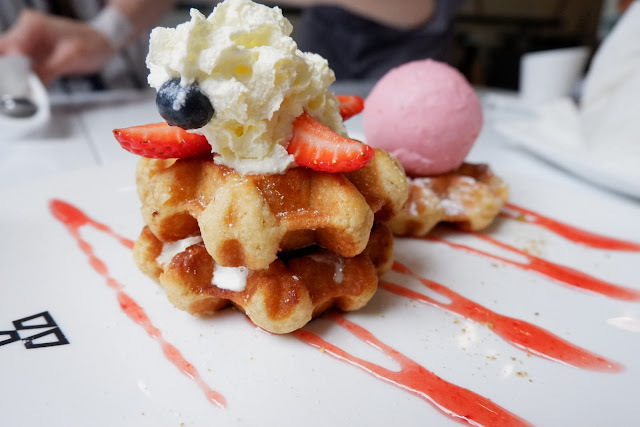 There are blueberries, fresh cut strawberries and whipped cream as well on the other waffle to make it not really strong. 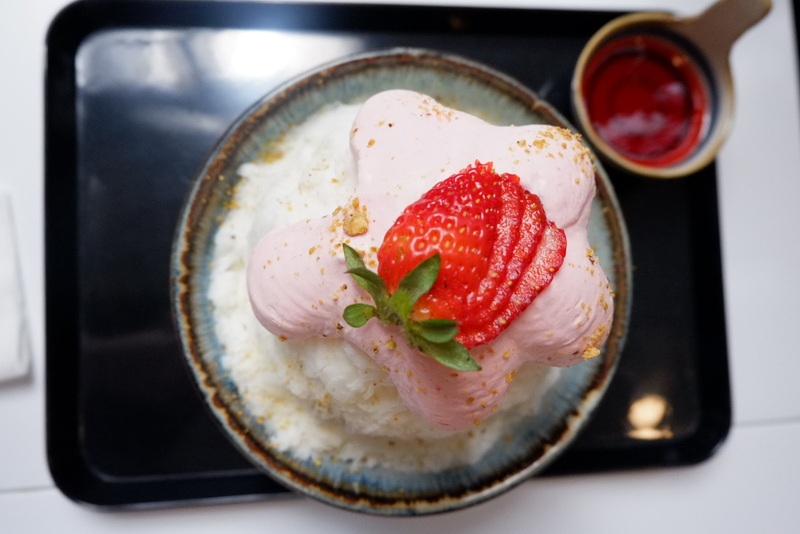 They put a strawberry syrup which meant to be a booster for this dish but turn out the syrup make the dish more complicated. It will be great if we put a crumb nuts on the top and mint leafs for garnish. It is a heavy dessert that perfect for a sweet tooth. 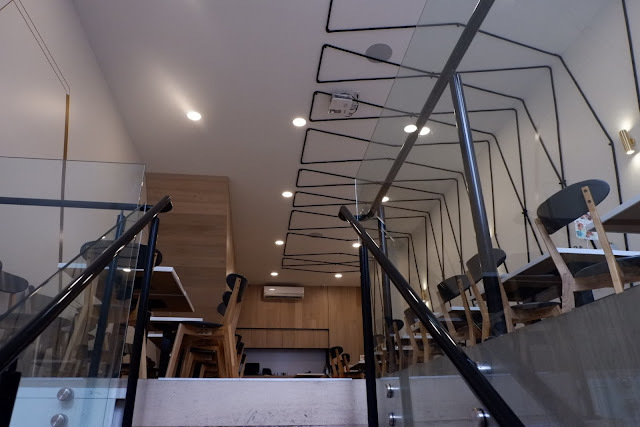 Taste of Uji. We had a high expectation for this because the presentation looks masculine and handsome in a tall stand glass. The ice cream is vanilla flavour and topped with matcha powder. We couldn’t find the matcha taste until we dig deeper and get the red beans mixed with rice ball and matcha. Because we had a high expectation before, it was a bit disappointing for this good looking ice cream. 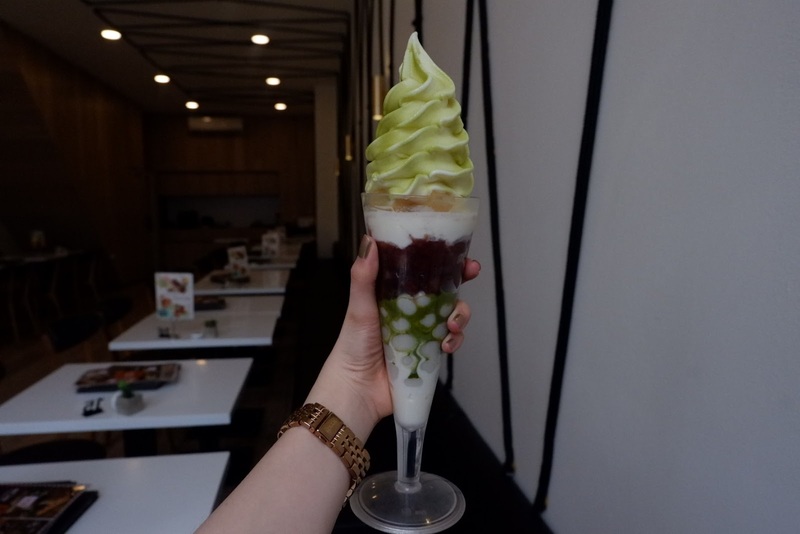 It will be great if they use a real matcha ice cream or vanilla ice cream with more flavour and less of red bean. 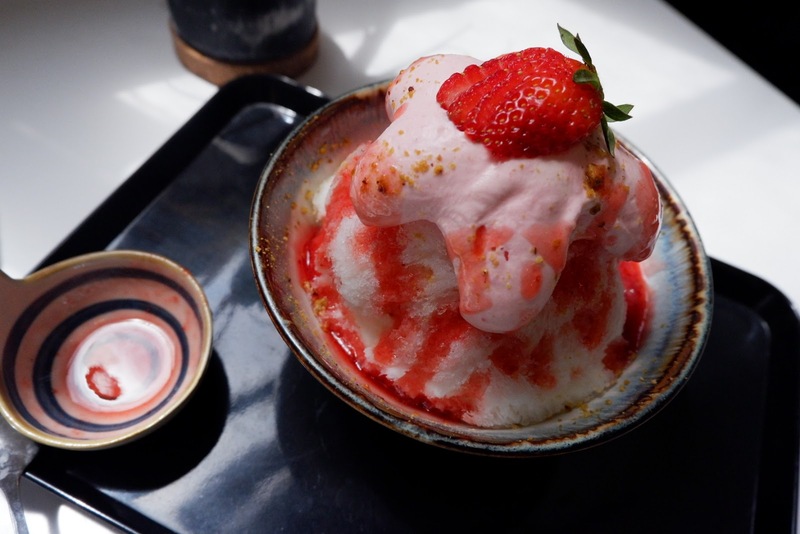 Summer Strawberry Cheese Cake Ice.They have a new summer product which is ice poured with strawberry syrup and melted strawberry cheesecake and cut strawberries on the top. It is my favourite out of all. 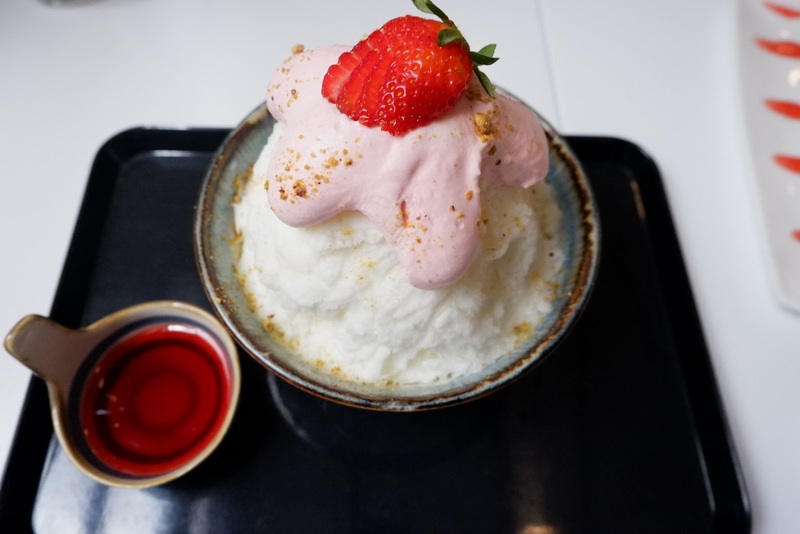 The strawberry cheesecake is amazing, not too sweet and not too light; the taste just precise and all of the component are balancing each other. Thank you to the chef made the new product for us even though we didn’t order it and we were glad to taste it.